Hi, I am Tim Carter from AsktheBuilder.com. I am up here on my garage roof at the end of summer. About six months ago, I started a test of some gutter guards. I want to show you how they performed in the spring and summer. Back in the early spring before the trees started dropping all their debris, a professional came out and installed a gutter guard. It is a micro-mesh gutter guard. The gutter guard has an ultra-fine micro-mesh design. Now at the end of summer, the guard is almost like the day it was installed. No debris on it. This has performed the best of any gutter guard I tested. 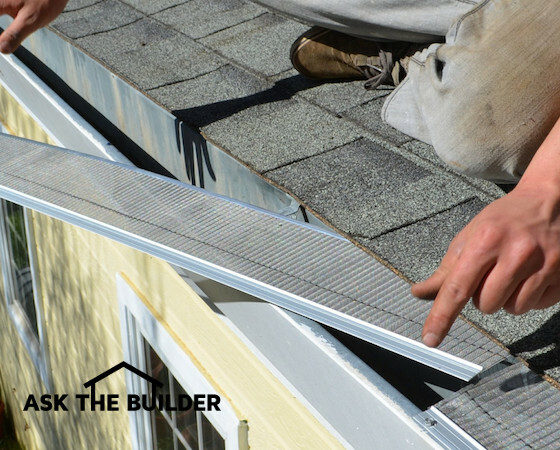 CLICK HERE for FREE & FAST BIDS from local companies that can install micromesh gutter guards. There are many micromesh gutter guard products. You can save LOTS of money putting them on yourself. CLICK HERE or THE IMAGE to see how low-cost they can be. Back at the end of spring, there was debris that built-up on this gutter guard. The debris was from the oak tree and consisted of the fine seed blossoms. But you know what? The wind and rain washed the debris off the gutter guard! Another micro-mesh gutter guard that was tested, did not fair as well. This gutter guard was installed about 18-months ago. This particular guard has debris, leaves and branches stuck to it. This debris accumulated in the past six-months, but has not come off. What happens year after year, if this is not cleared off by Mother Nature? That will be a problem. This gutter guard was installed at a different angle than the first gutter guard I showed you. The first guard, that performed the best, was installed at the same angle, or slope, as the roof. Next I will show you a gutter guard that failed miserably. This gutter cover looks like a giant pipe cleaner. The directions say just get up on the roof and shake it out if it needs cleaning. This gutter guard trapped all kinds of leaves, twigs and other debris. The manufacturer said just pull it out and shake it clean. That defeats the purpose if you have to get up on the roof to clean it. The gutter guard should keep you from getting up on the roof forever, if possible. I am installing the first gutter guard on my entire house. 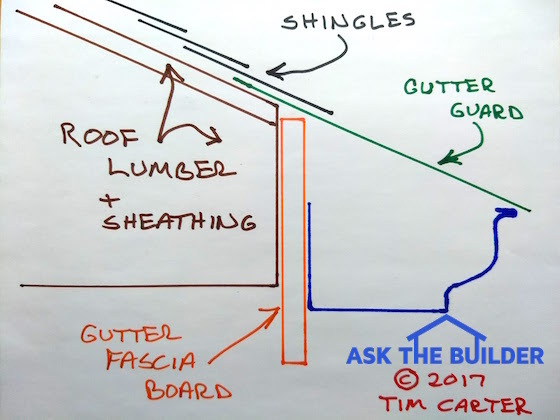 To find the winner, visit https://www.askthebuilder.com/gutter-guard-test-results/.